Galactic Mergers of Black Holes - Universe Galaxies And Stars Section. Black Holes Grow With Galactic Mergers. Hubble image of various galaxies in the process of galactic mergers. Image credit: Hubble. The Hubble Space Telescope has helped to reveal that the supermassive black holes at the heart of galaxies have grown large because of ongoing galactic mergers. 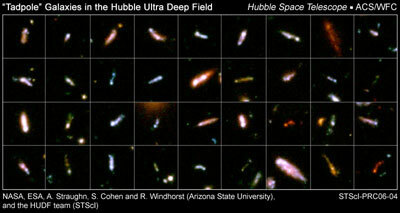 By studying Hubble's Ultra Deep Field survey image, Astronomers have located dozens of "tadpole" galaxies. These are galaxies in the process of merging together. These early black holes are enshrouded in dust, so the light coming from them is constant. More mature black holes have cleared out this dust and vary in brightness depending on the amount of material they're feeding on.